“She needs to be stopped,” Moriah Day said. The 7 Investigators were the first to expose an adoption scheme centered in Macomb County that’s now under federal investigation. Now, one of the young women who gave up her baby for adoption is coming forward, talking exclusively to 7 Investigator Heather Catallo. MACOMB COUNTY, Mich. (WXYZ) — The 7 Investigators were the first to expose an adoption scheme centered in Macomb County that’s now under federal investigation. Now, one of the young women who gave up her baby for adoption is coming forward, talking exclusively to 7 Investigator Heather Catallo. Ever since FBI agents raided Tara Lynn Lee’s New Haven home in November, the 7 Investigators have been following the threads of this cross-country adoption scheme. Lawyers involved tell us about 140 families across the country may be victims of Lee. The feds say the 37-year-old has defrauded couples from Colorado, Minnesota, Georgia, South Carolina, Indiana, Alabama, Kentucky, Ohio, and Michigan, who were all hoping to adopt babies. Court records show Lee allegedly took more than $200,000 from the prospective adoptive parents. The feds say Lee often “double matched” families, promising the same baby to more than one couple. Federal agents also allege Lee would take thousands of dollars from adoptive couples for babies that didn’t actually exist. Tara Lee and her business Always Hope Pregnancy and Education Center never had a state license to work on adoptions, and Lee is now charged with federal wire fraud . At the age of 19, Moriah Day placed her daughter up for adoption through Tara Lee. “She needs to be stopped,” Moriah said. “Is she a predator,” asked Catallo. Moriah says as soon as she found out she was pregnant, she turned to her long-time friend Lee because she believed Lee was a social worker. Northwestern University officials confirmed to the 7 Investigators that Lee’s social work diploma from the university is fake; FBI agents detail in the criminal complaint that they confirmed that with the school as well. Lee also has a criminal history for check fraud. “She had me signing papers at five or six weeks pregnant,” said Moriah. Adoption experts say legitimate agencies never match birth moms with adoptive parents until at least 12 weeks due to miscarriage concerns. Moriah says Lee told her to lie to the adoptive parents about her due date. “Why do you think she wanted you to lie about how far along you were,” asked Catallo. “Because the moment I matched, she could start charging people for money,” said Moriah. Moriah later told the adoptive parents the truth about her due date. At one point during the pregnancy, Moriah says she wanted to back out of the adoption, but she says Lee convinced her that her daughter would have a better life with parents who could afford to care for her. “I just kept telling myself, if you can just deal with these feelings, if you can just get through it – if you can just do it for her – she’ll have everything that you can’t give her,” said Moriah through tears. 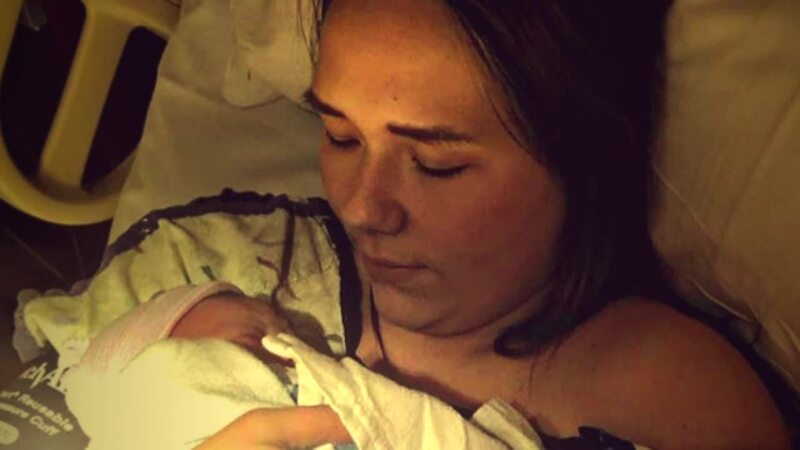 Moriah says she learned after she gave birth, Tara had told the adoptive parents they could leave the hospital with the baby without letting Moriah say goodbye. “I just stood there, and watched them walk out. And I remember I called Tara and I was so sad because I just couldn’t believe it – we just went through this whole 9 months with me,” said Moriah. In previous interviews, Tara Lee’s attorney, Sanford Schulman, has described Lee as an adoption coach and an advocate for birth moms. “She never had a license to do this work and she took a lot of money from people – what’s your response to that,” asked Catallo on January 14, 2019 after one of Lee’s court hearings. But Moriah says Lee did not go to doctor’s appointments with her, and she says Lee left her alone for the first part of her labor. Moriah says she’s made peace with her decision to give up her daughter and now has a wonderful relationship with the adoptive parents. She says now she just wants Lee to stop hurting families. “I want you to be buried under the jail, because I don’t kiss my daughter every night because you manipulated me into thinking I wasn’t capable of being a mother. And I don’t want to live in fear anymore,” said Moriah. If she’s convicted of the federal wire fraud charge, Tara Lee faces up to 20 years in prison. Tara Lee’s attorney told us he’s waiting on more discovery and is not prepared to give us an official statement at this time. "Not only were there 100+ adoptive families financially and emotionally defrauded by Tara Lynn Lee, but there were scores of expectant women and birth mothers also affected by her fraudulent, coercive and unethical actions. Our goals are first, to cooperate with the FBI investigation and let justice be served, and second, to hopefully affect change in adoption laws to better protect all sides in the adoption process." If you have any information about this adoption probe, please email Heather at hcatallo@wxyz.com or call 248-827-4473.